Pilgrims travelling between Inchcolm and St Andrews would stop at an ancient well and the panoramic view makes this still a special place. The earliest record of a church here is 1178; there are records for ministers from 1574. 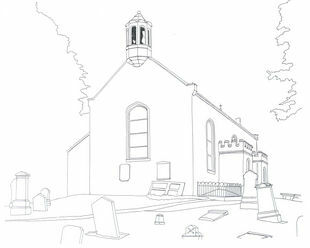 The present church was reconstructed in 1833 using earlier fabric. Stained glass includes a window of St Andrew used as inspiration for concerts. Many improvements, including the pipe organ by Casson & Millar, were the gift of one minister, the Rev William Stevenson. A table gravestone in the chuchyard is dated 1604.